* Cook together. Teach your children/spouse how to make your family tradition food. Come up with new family tradition delicacies together, making the things you most like of what is available and in season right now. * Make seasonal conserves, spices, relishes, and other such things for Samhain and to give as presents to all your friends and relatives. The harvest is coming in as we speak, and there's plenty of things to do. Try something new and exciting. * It's always fun to bake and decorate cookies together, so gather the family in the kitchen for baking. * Gingerbread houses are not for Yule only. The spices are mostly the same, and you can make houses of most cookie doughs, it doesn't need to be gingerbread. Try your favorite cookie dough. 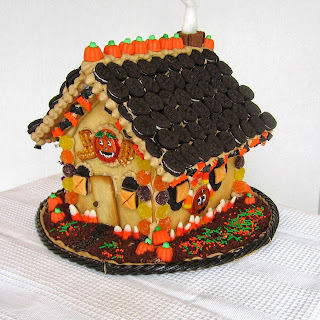 Decorate a real haunted cookie house for Samhain decoration. It's fun to do, and a really nice decoration, and then it's fun to eat after Samhain. And here comes a rant. I know, I'm a ranting person. Sorry about this. It's really not that a big deal to make a gingerbread house. I mean... there are these plastic thingies, "reusable" "gingerbread" houses... you just put them together and decorate with candy, and that's it. After the party you take the house apart, wash it and store, as just another piece of crap taking place. A REAL gingerbread house - or sugar cookie house, if you want to use candy that doesn't go with the special gingerbread taste - and most candy doesn't, I think - is broken into pieces, demolished, and devoured by delighted little vandals, and THAT's the most fun part of these edible pieces of decoration. "Who has time today to bake, assemble and decorate a gingerbread house?" and "Nobody has time to bake and assemble a gingerbread house these days. There just isn't enough time to do it all." What? IT'S NOT THAT BIG A DEAL! And then I read this review. "I don’t know how many times we have bought a gingerbread house at Christmas time only to eat the candy off the top and maybe a shingle or two off the roof. Quite frankly no one in our house (except me) eats ginger so the thought of a ginge-rless house that we can all enjoy without the leftover soggy house sounds perfect to me." I'm sorry, but if your house is "soggy", you are doing something very, very wrong. Now, I don't know where in the world this lady lives, but if the weather is too hot to build a gingerbread house in February, then she probably lives quite down South. And perhaps she should review her holiday traditions AND STOP TRYING TO CELEBRATE A FEAST AS IT'S DONE IN NORTHERN EUROPE!!! Of all the stupid people... Plastic houses just to... Grr! And also, I reacted on that in the review she says that it's a good idea to get two bowls of candy, one for the house and another for kids to eat as they decorate... If your child isn't old enough to not eat something he/she may not eat - like candy that is meant for decorating a candy house, or cookies made for a wedding, or what ever it is - he/she isn't old enough to be alone around anything edible, especially sweets and treats. A 4-years-old should know the difference of "mine" and "yours", and should know that everything belongs to someone, and if it doesn't belong to me, it's not mine to do anything with. I may not eat candy I find lying around, even if it's lying in a candy bowl on the table by which my mommy is busy using the candy to decorate a plastic house with. Isn't that basic manners? Pish.